From 9:30am to 11:30am Monday - Friday we will reserve a whole field at the center for play with all of our fun games and toys. We have balls, frisbees, tunnels, super sized soccer balls, noodles, hula hoops, and more! If a birthday room is open, it will be made available as a snack room. You may bring your own snack/drinks or they are available at the concession stand. Come in any day and bring a friend, make it a play date! Strollers are welcome on the field. This is a pay as you go program, $7 per child 18 months and older, $3 for children under 18 months who are participating (No charge for under 18 months and not playing). Rewards cards are available; 10 sessions for $60 (save $10). 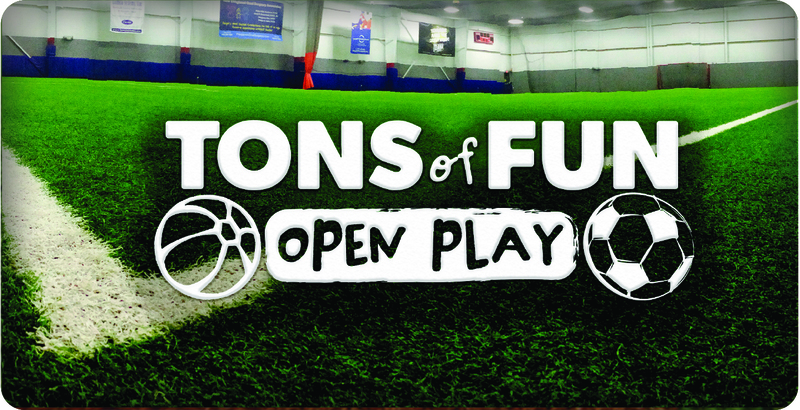 If you have a larger group and want to reserve your own "Tons of Fun" play date, call us and we can set up a day/time. Want to come in weekly or monthly? Talk to a TSC manager and we can provide an even better rate!